Marie’s Room is set mostly in one room. It goes along like a stage play. Through objects and memories, you slowly unravel the story of two girls and a friendship gone wrong. And you have to do it all in one sitting. I was taking a look at the new releases on Steam yesterday, and stumbled across Marie’s Room, a game by Kenny Guillaume. It was free, looked gorgeous, and the pitch—a narrative game specifically meant for one play session—seemed to guarantee my evening gaming plans. Early on, it sets out the ground rules. You have to experience Marie’s Room in one go. There are no saves or checkpoints. You can pause, but that’s about it. Thankfully, Guillaume also respects the time he asks for. The game should only take an hour at most to see it from start to finish. Without going into it too much for fear of spoilers, Marie’s Room uses its run time very well. From the perspective of Kelsey, Marie’s childhood friend, you join the story at the end. Something happened between you and Marie, and in retracing the past, you can gradually uncover the truth. 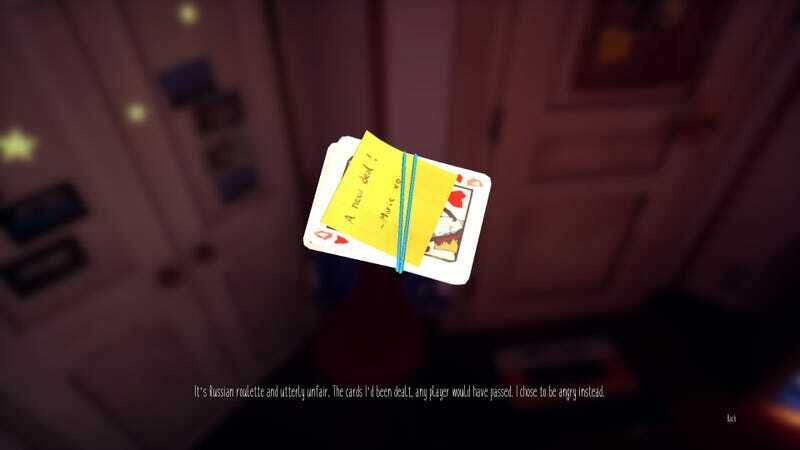 You can pick up and rotate objects, observing them as Kelsey comments on a fond memory or just the relation it holds to her and Marie’s relationship. Some are funny, like a ticket stub for La La Land; others hold more painful emotions, like a ripped shirt or photograph. Soft music plays and the sun shines in through the window, draping over each new piece of the past you uncover. It’s very reminiscent of games like Gone Home, except here, Kelsey is aware of everything and the player is left in the dark. It feels almost like an interview, as you hold up items for Kelsey to answer and comment on. Little threads dangle, leaving small ideas like an orange grove or a night-time swim ominously hanging as portents of something darker, the thing that might have pushed these two apart. Where all those threads eventually lead to is a surprising ending. I saw bits and pieces of it coming but was still taken aback. If you’re concerned about spending an evening making yourself sad, don’t worry. Marie’s Room ends on a neat, albeit lightly vague resolution. If you have a spare hour or so and enjoy seeing what game creators are doing in storytelling, Marie’s Room is worth your time. It’s short, sweet, and has left me thinking about its choices for long past the single sitting it asked of me.